Seagate Momentus 7200.4 hard drives provide the optimum combination of performance, capacity and mobility in a 2.5-inch form factor. They are also a good fit in certain non-PC applications, including external storage, copiers/printers and entry-level blade servers. 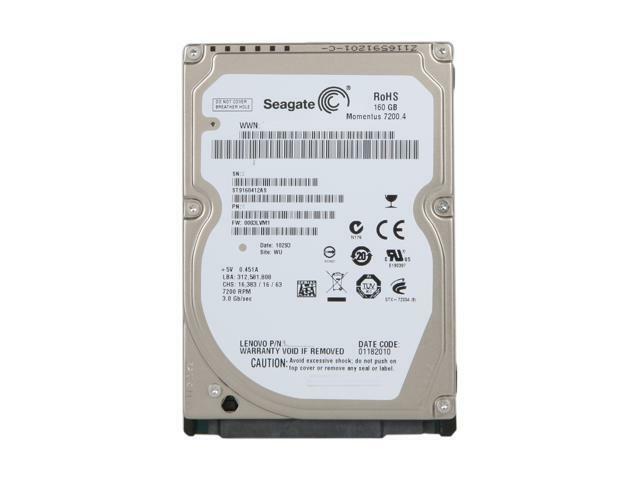 High Performance Hard Drive The high performance 7200 RPM 2.5” hard drive provides a large capacity, high speed cache and SATA 3Gbps, perfect for storing and backing up your movies, music, applications and documents. Low Power Consumption With nearly 5400RPM-equivalent power consumption, the Seagate Momentus 7200.4 hard drive delivers superior power efficiency. Pros: It was brand new, it performs exactly as I expected, and was priced right. 7200 rpm 16mb cache. Other Thoughts: Bought to clone my laptop internal SSD drive and it does exactly what I wanted. As mentioned in Pros it is brand new and reasonably priced. Pros: Great read time, it's sata, and it has a 16mb cache. Makes my laptop load windows and other programs faster. Comments: Wish I had put a larger capacity drive in place, but I now work almost exclusively off of a 1tb external. Pros: It's a Seagate. Fast, I had an 80GB that died at age of 4 yrs 5400RPM, I'm diggin the 7200 with the large Cache. Cons: Come on, Seagate apparently puts 1GB as 1000MB so the total size is 149GB. I'll look into Western Digi to see if they are the same. It's a little loud even when quite. Pros: Rob and those that say it is dead. Send it back to Seagate and they send you a new one even after 3 or 4 years. Cons: It can't make me coffee. Other Thoughts: Some of these reviews are done by people with sad lives and or agenda's. Newegg is responsible for culling bad reviews that are agenda driven. Pros: Solid, fast, and stable drive. Never had a Seagate fail on me personally. Clients, every now and then (it happens) but never me personally. Cons: Doesn't cook waffles for you. Other Thoughts: UPS was, as always, a day late and a few hours behind on that day, but what else would you expect from brown? Cons: Drive died and is now outside the 30 day newegg warranty. Other Thoughts: I will think twice about buying a seagate drive in the future.